These wide fit brown leather brogue boots from Loake feature a classic brogue design of perforated and stitched patterns and trims, a pull tab to the back of the heel, a round toe and a chunky black heel and sole. A pair of shoes for £200!! Are they for elephants? Avoid!!! Awful quality. Bought one last year on sales, worn out in short time, rubber!!! Avoid!!! Awful quality. Bought one last year on sales, worn out in short … Avoid!!! Awful quality. Bought one last year on sales, worn out in short time, rubber!!! Worn out!! What were u doing with them? 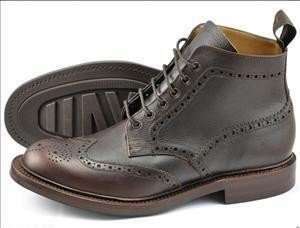 Have a few pairs of Loakes, excellent quality, British made and not that expensive compared to Grenson, Barkers etc. Great quality shoes, I've been in the factory and seen them made by hand. Last for years and worth every penny. Loake are one of the few brands that live up to their name.